The fireproof document bag is treated fiberglass sylicone fabric on the outside. For added protection for your valuables in case of any fire outbreaks. With it's protective layering, The fireproof document bag Can Withstand Over 1292 F of continuous temperature. The fireproof document bag has been tested in our laboratories multiple times before it hits the market. Our Fire resistant document bag can withstand up To 1292 F of extreme heat. It also features a fireresistant adhesive lock, for overall protection and security. High quality fireproof envelope, capable of holding small-sized documents, can also make an excellent fireproof safe pouch for your cash; your precious belongings are perfectly safe in case of emergencies; fits any small storages like safes or deposit box, can be folded. Happigo Fire Resistant Document Bag should be paired with a Fire Resistant Safe, since any fire resistant material is still susceptible to high temperatures after extensive exposure. To help provide additional protection, place flat side down (of Fire Resistant Bag) on the lowest level of your house (like your cellar, but not in a wet area), AND/OR whenever possible, place the Fire Resistant Pouch inside a Fireproof Storage Safe to serve as an additional layer of protection. SUPERIOR FIRE PROTECTION: Made of high quality Liquid Silicone Coated Retardant-fiberglass exterior. 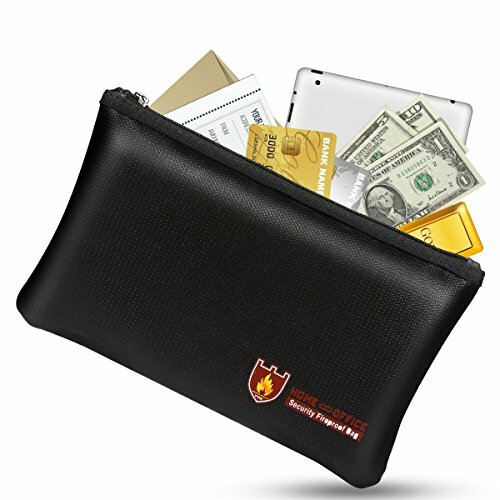 which can withstand temperatures as high as 700 (approximately 1292 ), so you can keep all your valuables 100% safe, this document pouch brings peace of mind in case of a fire or burglary. Works great if you need to leave for a weather emergency quickly also. Remember it is for those just in case moments. NON-ITCHY SILICONE FIBERGLASS PROTECTION - Not only does our bag keep your valuables protected, but your hands as well! You should never have to worry about wearing a pair a gloves to avoid getting painful splinters when adding or removing items from your fireproof bag, and we made sure our bag met that expectation. The entire exterior is infused with a thick layer of smooth silicone for safe handling. WATER RESISTANT - Not only does our bag stand up against fire, but it's also highly water resistant just in case it gets wet for any reason suitable for both men and women. It is also the best choice for gifts. SAFE TO USE: Our fiberglass bag is made from safe high quality products, giving you the confidence to handle it with total peace of mind. Keep your valuables nice and safe with the heaviest duty fireproof bag around. Click 'Add to Cart' now! FIRE PROOF & WATER RESISTANT - Made of high quality Silicone Coated Retardant-fiberglass exterior and aluminum foil interior, which can withstand temperatures as high as 1000 C (about 1832 F), so you can keep all your valuables 100% safe. LARGE CAPACITY - With a large capacity of expanded demension 15 x 11, you can put many valuables in it, such as cash, jewelry, passports, documents, tablets, photos, Li-Po Battery, etc. and so on. ZIPPER & HOOK & LOOP CLOSURE, DOUBLE PROTECTION - Unlike other fireproof bag, our fireprooof bag features with a zipper plus HOOK & LOOP closure design, provides you double security and maximum protection. Material: Fiberglass + Aluminum Foil. Expanded Dimension: 15 x 11(38cm x 28cm). DOUBLE layer of high-tech fireproof fiberglass. Our fireproof bag can provide up to 2000 F temperature protection (SGS TEST: UL94 VTM-0 Certified). Silicone coated double layer of fiberglass provides great water resistance capacity. Metal zipper, velcro closure, and reinforced seams for additional protection. 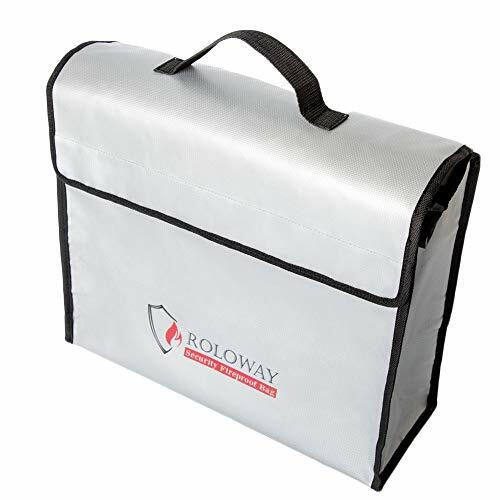 Roloway fireproof bags are coated with high tech NON-ITCHY SILICONE on fiberglass cloth. Very smooth & convenient to carry, no gloves are needed. With handle & adjustable shoulder strap, Roloway fireproof bag is super easy to carry all around in any emergencies. Meantime, it simply can be folded to store in the safe box or take to any other places as you wish. With XL capacity of expanded dimension: 15" x 12"x 5", which can store up to 500 sheets of legal papers. You can put ANY VALUABLES in the bag, like cash, jewelry, passports, documents, photos, Li-Po Battery, and even LAPTOP and PAD. With great product quality, we are confidence to provide LIFE TIME warranty. If you dislike our product for any reasons, we promise to offer replacement or refund. Please keep away from little children. Do not immerse or wash the bag in liquid. Our product is a high quality fireproof bag which supports high temperature & fire exposure, but same to many fire resistant objects, it will not support endless fire exposure. Please keep any fire exposure to the minimum. FIRE PROOF & WATER RESISTANT BAG : With high quality FIBERGLASS, our fireproof document bags can easily stand temperatures as high as 2000 F (SGS TEST: UL94 VTM-0 Certified). Meantime, two SILICONE COATED layers bring great water resistant ability which enables to survive the intense spray of firefighter's hose on full blast. In another words, your valuables are 100% safe in our bags. 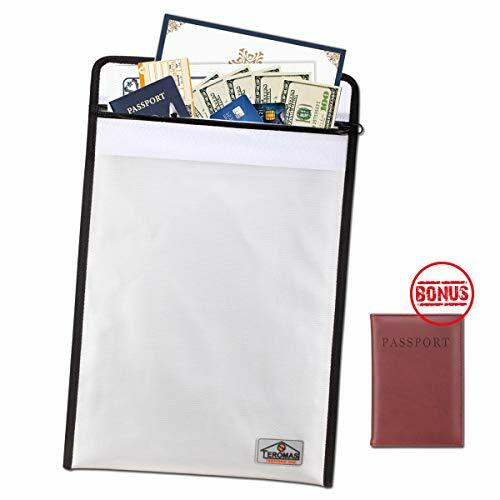 NON-ITCHY SILICONE COATING&EASY TO CARRY BAG :ROLOWAY fireproof money bags are coated with high tech NON-ITCHY SILICONE on fiberglass cloth.That means, you don't need gloves. With handle & adjustable shoulder strap, Roloway fireproof cash bag is super easy to carry all around. 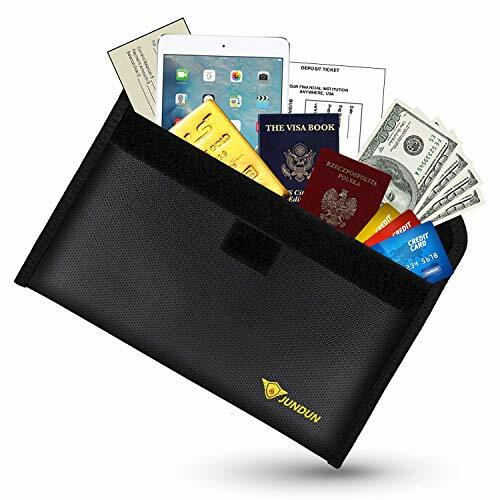 EXTRA LARGE CAPACITY & FOLDABLE BAG : With a XL capacity of expanded dimension: 15 x 12x 5, you can put ANY VALUABLES in the fireproof folder bag, like cash, jewelry, passports, documents, photos, and even LAPTOP and PAD. Meantime, it simply can be folded to store in the safe box or take to any other places as you wish. ZIPPER & VELCRO CLOSURE : DOUBLE closure - both ZIPPER and VELCRO, seams are reinforced and stitched to a tight pattern on every fireproof bag. Plus the strap, all is to keep your precious in absolutely safe condition. LIFE TIME WARRENTY& CUSTOMER SERVICE : If you have any issue about fireproof bag, feel free to contact us. We promise to arrange a replacement or refund. No worries at all. Our customer service will always be here to help. The fireproof bag is a must-have for your valuable items that you want to keep safe. This fireproof document bags is tough, portable and foldable which is great for everyday use, or for long-term storage in a safe-deposit box or home safe. 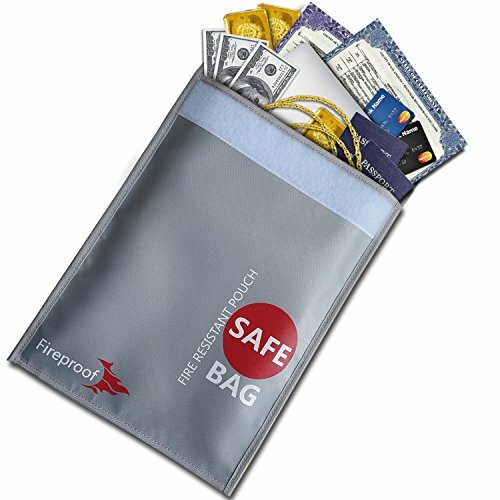 Fireproof document bags use for: you can use it to store cash, jewelry, passports, documents, tablets, photos, mobile power, Li-Po Battery and so on. 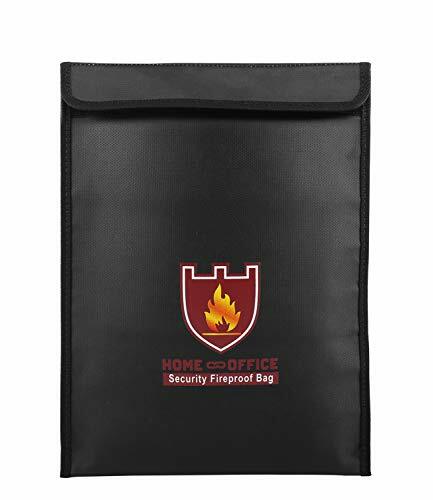 FIRE & WATER RESISTANT: This fireproof document bag is made of upgraded silicone coated fiberglass fabric, which can withstand temperatures up to 700 (approximately 1292 ) and protect your vital documents from fire. This fireproof safe bag which is not only fire resistant but also high water resistant in case it gets wet for any reason. A4 PAPER SIZE CAPACITY : With size of 13.5*9.8 inches, this fireproof document bag can keep most of your most valuable items such as A4 size legal documents, cash, jewelry, passport and pad etc.. 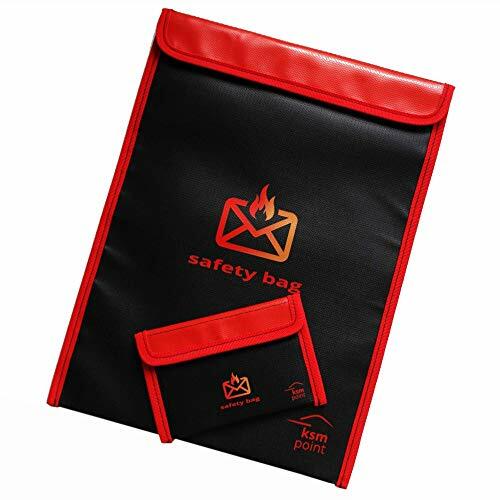 This fire safe document bag is flexible enough to be folded and taken on the go. FIREPROOF ZIPPER & SEWING THREAD: Fireproof zipper closure for extra security. You needn't worry your valuable items fall out of this fireproof bag. Fireproof sewing thread and fireproof zipper used in our fireproof document bag brings 100% fireproof guarantee for your valuables. HOME AND OFFICE USE: This document safe pouch is widely use, can be used both at home and office. It is convenient to keep and carry. This fireproof document bags also can be easily folded, so you can use it in drawer or strongbox. WHY CHOOSE THE FIREPROOF BAG : Safe document storage designed to protect valuable items from fire, rainwater, or any explosion caused by incorrectly charging or poorly functioning lithium battery packs. 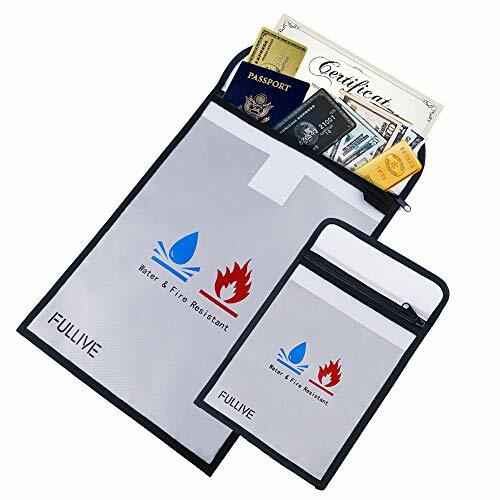 This fireproof document bags can keep your valuable items safe even at unforeseen fires. If you are not satisfied with your bag, receive a 100% refund on your purchase. The lockable fireproof bag is available at a low promotional price for a limited time! Click the Add To Cart button now. BLOKKD is a US-based company that specializes in designing and providing home and office safety products. 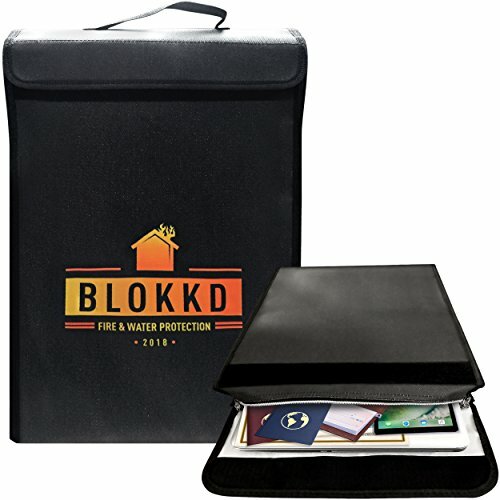 FIRE AND WATER PROTECTION - Protect your valuables from fire and water damage with a professional fireproof bag from Blokkd. The double layered silicone fiberglass construction can easily withstand temperatures greater than a standard 1,100 F fire to ensure your possessions stay protected. MAXIMUM SECURITY - Rest assured with confidence knowing that your valuables are safe. Our fire resistant bag features a strong metal zipper closure that gets completely covered by a secure Velcro flap closure. The Zippers can be locked together with a combination lock for additional safety. 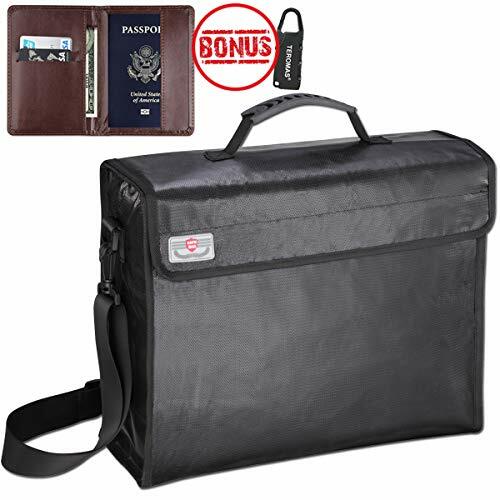 LARGE SIZE WITH BIG CAPACITY - (16 x 11.5 x 3) Blokkd fireproof briefcase bag offers a big capacity for you to safely stow your money, documents, files, laptop, passport, brith certificate, etc. The large size firesafe bag expands up to 5 inches wide to give yourself more room for growth. DURABLE AND HIGH QUALITY - The fireproof safe bag is engineered for rough handling to survive fires and perform reliably in all weather conditions. Suitable for outdoors, indoors, camping and even hurricanes. The foldable design allows you to store in a fire safe box, storage cabinet, metal drawer and cabinet. EXCEPTIONAL VALUE, MONEY BACK GUARANTEE - If you are not satisfied with your premium quality fireproof document bag, receive a 100% refund on your purchase quickly and hassle free! Each purchase comes with customer-friendly service by Blokkd, a U.S. company. The Blokkd bag is available at a low price for a limited time only. DOUBLE layers of high-tech FIREPROOF FIBERGLASS provide up to 2000 F protection (SGS TEST: UL94 VTM-0 Certified). SILICONE COATED double layers, and VELCRO CLOSURE for great water protection. We ENLARGED DIMENSIONS to 17" x 12" x 5.8", which is at least 30% LARGER than other large fireproof bag. Moreover, it expands up to 8 INCHES wide, which could load 3 RING BINDERS easily. Now, you can stow MORE VALUABLES in our fire safe bag, like money, jewelry, passport, birth certificate, files, documents, RC battery, laptop, etc. YKK ZIPPER means the highest quality, also, the UPGRADED ZIPPER can be LOCKED together with a combination lock for additional safety. The width of the VELCRO CLOSURES are ENLARGED by 20%. SEAMS are REINFORCED on every fireproof bag. Our fireproof bag is coated with high tech NON-ITCHY SILICONE. It's SMOOTH to get your valuables in and out, no glove is needed. It can be simply folded to store in the fireproof lock box, fire safe document box, storage cabinet, document safe, etc. With all the HIGH QUALITY materials & UPGRADED TECHNOLOGY, our fireproof bags perform reliably in all weather conditions. MULTI-PURPOSE for indoors, outdoors, travel, camping, and EMERGENCY PREPARATION, such as rain storms, hurricanes and earthquake. For any reasons, we promise to offer REPLACEMENT or 100% REFUND quickly. The combination lock is not included. FIRE PROOF & WATER RESISTANT BAG : With double layered FIBERGLASS, our fireproof safe bag can withstand temperatures as high as 2000 F (SGS TEST: UL94 VTM-0 Certified). Meantime, the SILICONE COATED layers, and VELCRO CLOSURE bring great water protection, which can survive the spray of firefighter's hose on full blast. All to keep your valuables 100% SAFE. Upgraded Capacity - JUMBO LARGE DIMENSION: 17 x 12x 5.8 : With 30% more capacity, you can safely stow MORE VALUABLES, like money, jewelry, laptop, passport, birth certificate, files, documents (even 3 RING BINDERS included), etc. Meanwhile, our fire safe bag can be simply folded to store in the fireproof lock box, fire safe document box, storage cabinet, document safe, etc. Upgraded Security - YKK LOCKING ZIPPER & WIDER VELCRO CLOSURE : YKK ZIPPER means the highest quality, also, the UPGRADED ZIPPER can be LOCKED together with a combination lock for additional safety. What's more, the width of the VELCRO CLOSURES are ENLARGED by 20%. Tight stitched SEAMS are REINFORCED on every fireproof bag. NON-ITCHY & DURABLE SAFE BAG : Our fire safe document bag is coated with high tech NON-ITCHY SILICONE. You don't need gloves to get your valuables in and out. With all the HIGH QUALITY materials and UPGRADED TECHNOLOGY, our fireproof bag is able to survive fires and perform reliably in all weather conditions. Suitable for indoors, outdoors, and even hurricanes. LIFE TIME WARRENTY & 100% REFUND : If you have any issue about your premium quality fireproof document bag, feel free to contact us. We promise to arrange a replacement or 100% refund quickly. No worries at all. Our customer service will always be here to help. -Fire resistant up to temperatures of 2000 F (Certified by SGS Test: UL94 VTM-0). -Double-layered, high quality fiberglass material. -The entire exterior is coated in silicone to prevent water damage (including the zipper). -Protect your valuables from the fire AND the firetruck. -The thick layer of smooth silicone also protects your hands from itchy fiberglass splinters. -No gloves are required when handling SlayMonday fireproof bags. -Extra wide opening and huge capacity to fit large items. -Quick and easy to "grab and go" during a fire evacuation or other emergency. -The bag can also be folded completely flat for storage. -Heavy duty construction with reinforced seams. Made to last in any environment. -Fully secured using a tight zipper seal, followed by a fiberglass cover with strong Velcro fastener. Nobody ever anticipates a house fire before it happens. They always come unannounced. That s why it s absolutely necessary to prepare for them ahead of time. And protecting your valuables is one of the best ways you can do that. A SlayMonday Fireproof Bag gives you the peace of mind in knowing that your prized possessions are safe and easily retrievable in the event of a fire or other emergency. 2000 F DEGREES MAXIMUM FIRE & WATER PROTECTION - Featuring double-layered fiberglass material, our fireproof bag can withstand temperatures up to 2000 F (Certified by SGS Test: UL94 VTM-0). This bag is also coated in silicone for exceptional water resistance, so your valuables will be protected from both fire and water damage. EXTRA LARGE CAPACITY (15 x 12 x 5 Inches) - Our bag features a massive, 15-inch opening and has an interior volume of over 900 cubic inches. There's plenty of room for all of your valuables, such as passports, birth certificates, photo albums, money, jewelry, legal documents, and even laptops. NON-ITCHY SILICONE FIBERGLASS - This bag protects your valuables AND your hands! You will never have to worry about wearing gloves to avoid getting itchy fiberglass splinters when adding or removing items from your fireproof bag. The entire exterior is infused with a thick layer of smooth silicone for safe handling at all times. HIGHEST QUALITY & DURABILITY - The bag opening is fully secured with a 2-stage closure system. First, it uses a rugged zipper that's coated in silicone for a tight seal. Then, the zipper gets completely covered by a double-layered fiberglass protector flap, which fastens down using a strong velcro strip. There's no way any flames will find their way inside! The bag's heavy duty construction makes it extremely durable, ensuring years of reliable use in any environment. PRACTICAL & TRANSPORTABLE - A sturdy handle provides ease of transportation in the event of a fire evacuation. A removable shoulder strap is also included for extra support while carrying. These features allow the bag to be carried by a person of any size, even with heavy items inside. When the bag isn't being used to protect large belongings, it can be folded completely flat and stored out of sight. SUITABLE FOR INDOORS AND OUTDOORS The versatility of our fire safe bag provides peace of mind. 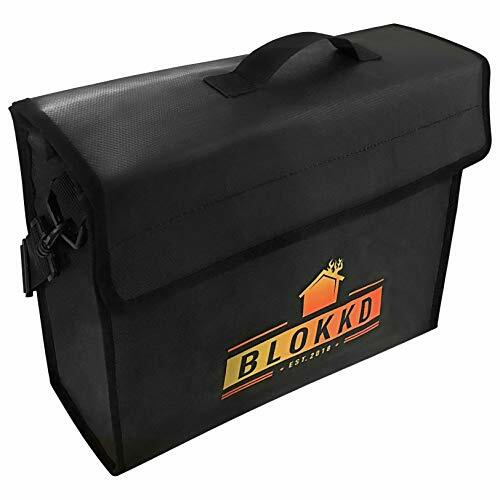 Blokkd portable fire and water proof bags are great for travel, vacation and camping. LIFETIME SATISFACTION GUARANTEE If you are not satisfied with your safe bag, receive a 100% refund on your purchase. The lockable fireproof bag is available at a low promotional price for a limited time! Click the Add To Cart button now. 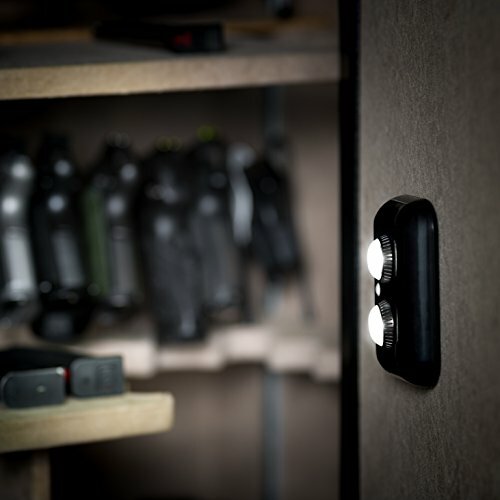 BLOKKD is a US-based company that specializes in designing and providing home and office safety products. FIRE AND WATER PROTECTION - Protect your valuables from fire and water damage with a professional fireproof bag from Blokkd. The double layered silicone fiberglass construction can withstand temperatures greater than a standard 1,100 F fire to ensure your possessions stay protected. MAXIMUM SECURITY - Rest assured with confidence knowing that your valuables are safe. Our fire resistant bag features a strong metal zipper closure that gets completely covered by a secure Velcro flap closure. The Zippers can be locked together with a combination lock for extra safety. 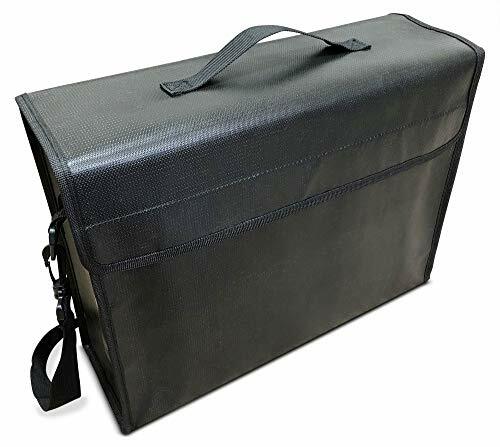 X-LARGE SIZE WITH BIG CAPACITY - (13 x 16 x 5) Blokkd fireproof briefcase bag offers a big capacity for you to safely stow your money, documents, files, laptop, passport, brith certificate, etc. The large size firesafe bag expands up to 7 inches wide to give you more room for growth. DURABLE AND HIGH QUALITY - The fireproof safe bag is engineered for rough handling to survive fires and perform reliably in all weather conditions. Suitable for outdoors, indoors, camping and more. The foldable bag allows you to store in a fire safe box, storage cabinet, metal drawer and cabinet. FIRE PROOF & WATER RESISTANT: Teromas fireproof safe bag combined with double layer high quality fiberglass(Out layer: silicone coated strong fiberglass fabric, Inner layer: aluminum foil laminated thermal insulation material), Stand temperature up to 2000 . In addition, our bag is also highly water resistant, as well as the zipper, it is made by waterproof material. EXTRA LARGE CAPACITY & FOLDABLE BAG: With our 15 x 11 inches fireproof bag, you can put any valuables without struggle. 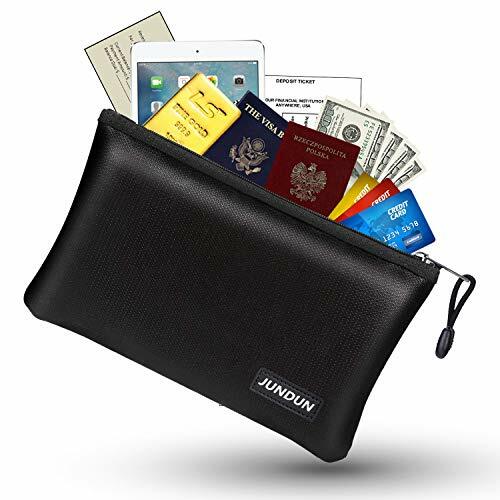 It's big enough to store cash, jewelry, passports, documents, photos and even laptop or PAD. Meanwhile, it can simply be folded to store in anywhere as you wish. NON-ITCHY SILICONE COATING DESIGN: With high tech NON-ITCHY silicone on fiberglass layer, you could never have to worry about wearing a pair of gloves to avoid getting painful splinters when adding or removing items from the fireproof bag. And there is no odd smell at all in the bag. DURABILITY & RELIABLE: With a ZIPPER coated in silicone and a super-strong VELCRO strip, there's no way any flames will find their way inside. LIFETIME WARRENTY & CUSTOMER SERVICE: 5 years warrenty, 24 hours /7 days service, Any issues please contact us by email, we'll send new replacement or refund at first available time. HIGH QUALITY & COMFORT: Our fireproof documents bag is heavy duty constructed, it is extremely durable, featured with high quantity silicone coated fireproof fiberglass, Non Itchy, Non Smell. The adjustable strap fits all and the ergonomic handle makes it comfortable to lift. MULTI PROTECTION: The opening is fully secured with a two-way rugged ZIPPER which covered by protector flap with a super-strong VELCRO strip, there's no way any flames will find their way inside. What's more, the package also comes with a coded lock to make sure your valuables or confidential documents in absolute safe. JUMBO OVERSIZED DESIGN: With 15 x 12 x 5 Inches XL fireproof container, you can put any valuables without struggle. It's big enough to store cash, jewelry, passports, documents, photos, laptop or PAD. Meanwhile, it can simply be folded to store in anywhere as you wish. Big items require a big bag. The extra large "wide mouth" fireproof document bag by Thomas & Bond is what you're looking for to fit your largest valuables, especially: Large legal files (and their holders) like mortgage papers, titles and deeds Binders with a spine width as large as 4 inches Laptops as wide as 15" across Photo albums, scrapbooks, yearbooks, artwork, treasured photos Stacks of cash! Go big and take it with you! With the comfortable shoulder strap and convenient carry handle you can take your valuables with you in this legal size file organizer whenever you want. When not in use the bag lays flat and can be folded in half to take up less space than your favorite coffee table book. 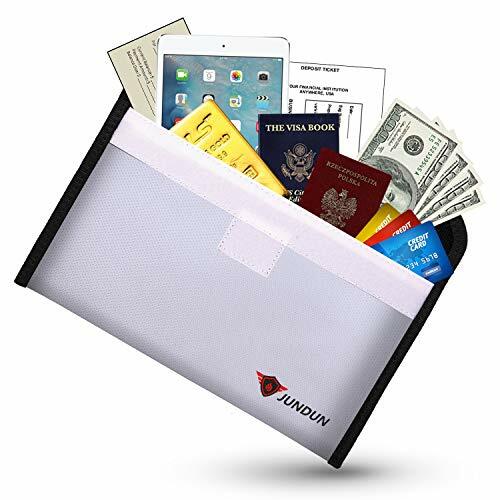 Order this fireproof file organizer today and enjoy the benefits of being fireproof! 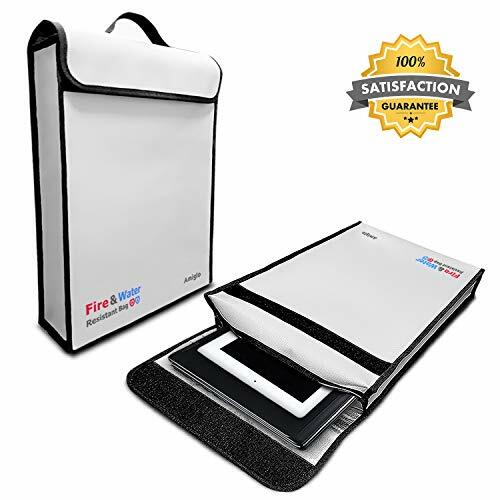 HOLDS GIANT DOCUMENTS AND LEGAL FILES - The 18" width allows this fireproof bag to swallow up huge files like a document organizer without having to fold or bend them. It can hold 15" laptops and other extra large items. Protect your valuable documents, passports, money and jewelry! HANDLES BIG BINDERS AND FOLDERS - The 5 gusseted bottom on this extra large fireproof case is very wide. It will protect items from damage like your college yearbooks, bulging photo albums and your kids' grade school artwork - they'll all fit! And the best part is, you don't have to fold anything to make it fit! IT'S LIKE A WATERPROOF FIREPROOF BOX - ...But significantly lighter and fully portable. Be safe! Take your important valuables wherever you want, whenever you want. 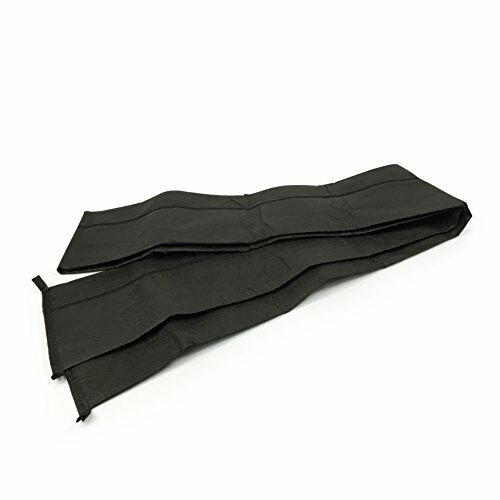 When not in use, this fireproof briefcase bag can be folded and laid flat unlike a regular fireproof file bag. GIVES YOU PEACE OF MIND - A double layer of non-itchy silicone coated fiberglass protects like a fireproof box against fire and water damage. The heavy-duty zipper on this fire box for documents is also covered by this same material and is secured in place by a thick Velcro strip. This fire proof bag provides you with maximum protection. NO RISK TO YOU - Our ambition is to delight you. If you are not satisfied for any reason, simply return the fireproof bag for documents and we will issue a refund no questions asked. What makes Amiglo fireproof document bag more valuable than other options? Unpredictable fire emergency can occur at any place and time but we will never know before it happens. Here are some valuable features of our fireproof bag and will present you why it is chosen by the public over the years. Our fireproof bag will provide you peace of mind for your secure life! Best housewarming gift for friends, coworkers and family! HIGHEST GRADE SILICONE COATED FIBERGLASS - Amiglo fireproof bag is featured with silicone coated high-end grade fiberglass. Smooth touch and no more worries about irritation of fiberglass as well as fire retardant thread is applied for additional fire protection. DUAL LAYERS PROTECTION - Dual layers are made of durable and high quality fire retardant fiberglass and advanced aluminum foil material. Enhanced fireproof, withstand fire and temperature up to 2200 (1200 ). Perfectly guaranteed fireproof! 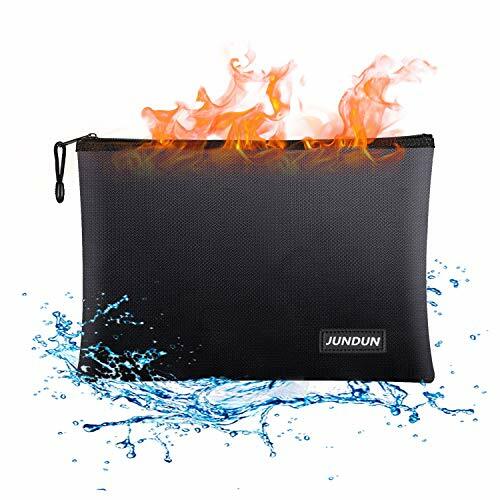 WATER RESISTANT FEATURE - Not only does our bag withstand fire and heat perfectly, but also highly water resistant to prevent from any kind of the wet. Strong metal zipper covered by a secure Velcro flap closure provides additional protection. EXTRA LARGE SIZE - 15x12x3 Sufficient space to securely store your cash, legal document files, passport, jewelry, laptop and valuables. 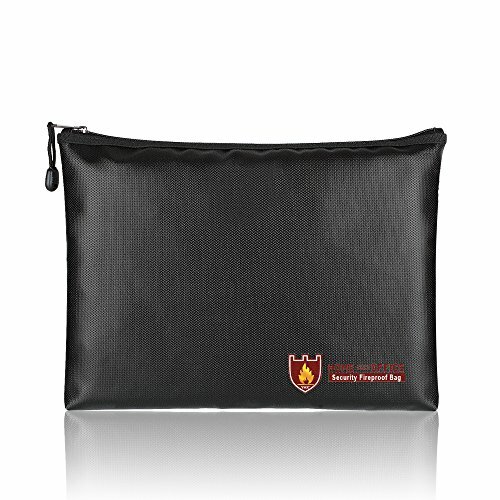 Our multi-purpose fireproof bag can hold over 600 pieces of documents and up to 20lbs in weight. 100% REFUND GUARANTEED - Any kind of non-satisfactory with our fireproof bag, send it back for a 100% guaranteed refund. No reasons and questions are required for your money back. Contact us via email any time! Nobody ever anticipates a house fire before it happens. They always come unannounced. That's why it's absolutely necessary to prepare for them ahead of time. And protecting your valuables is one of the best ways you can do that. What makes our fireproof bag better than the rest? Since you're reading this, you probably already know the importance of having a fireproof bag. But there are a lot of options to choose from. Here are some of the reasons why our bag stands out from the crowd. Double-Layer Fiberglass: Twice the protection of traditional PVC bags. Heat Resistance up to 2000 Degrees Fahrenheit: That's pretty hot! Non-Itchy Exterior, Infused with Silicone: Never worry about getting splinters! Massive Size (15.8 x 12.6 x 5 Inches): Never struggle to decide which items to save. Fiberglass Zipper Flap Cover: Fireproof protection, all the way around. Top-Mounted Carry Handle: For easy transport. Removable Shoulder Strap: For added support while carrying heavy items. Water Resistant Exterior: Save your valuables from the fire, and the firetruck. Heavy Duty Construction: This bag is made to last, even if it never sees a fire. 2000 F DEGREES MAXIMUM FIRE & WATER PROTECTION - Protect your valuables from being destroyed by unexpected fire and water damage with our heavy duty fireproof bag, featuring double-layered fiberglass protection. This bag can withstand temperatures up to 2000 F. It's also coated in silicone for exceptional water resistance. EXTRA LARGE CAPACITY (15.8x12.6x5 Inch) - Our bag features a massive, 15.8-inch opening and has an interior volume of over 900 cubic inches. There's plenty of room for all of your valuables, such as passports, birth certificates, photo albums, money, jewelry, legal documents, and even laptops. Non-Itchy silicone coated fireproof fiberglass. Water resistant and fire resistant. Large compartment to hold valuable possessions. Set of 2 to take more valuable stuffs. 1,Please keep away from children. 2,Do not immerse or wash the bag in liquid. 3,Although this safe bag support high temperature and fire exposure,it couldn't support endless fire exposure. So please do your best to keep any fire exposure to a minimum. Any question,please feel free to reach fulliveus@outlook.com. FIRE & WATER RESISTANT - Made of supreme fire retardant fiberglass and silicone coated layer exterior. Waterproof and fireproof,can stand up against fire and heat up to 2000 . NON-ITCHY SILICONE COATED - Featured with high quality silicone coated fireproof fiberglass, infused with a thick layer of smooth silicone for safe handling. DOUBLE CLOSURE - Fullive fireproof security bag adopts strong zipper closure that gets completely covered by secure Velcro flap closure, adds storage security and carrying safety.There's no way any flames will find their way inside. 2 SET SAFE BAG - Included two set money box,15x11 Inch and 7 x9 Inch.Enough Capacity for your valuable stuffs. Can be folded to store in the safe box or take to anywhere as you wish. CUSTOMER SERVICE - If you find any problems or you are not satisfied with Fullive safe bag,please feel free to contact us via fulliveus@outlook.com. We will try our best to help you. ENGPOW is professional manufacturer and supplier specialized in research, development and production of various fireproof office supplies. All of our fireproof products are complying with international quality standards and passed ROHS IEC62321 Certified. Do you worry about the damage to your valuables when a fire breaks out? Bring our fireproof document bags, although we hope you will never use its fire protection function, but having this bag is an option you won't regret. Protect your important documents and paper. Original Intention:Accidents happen when we least expect, and there's nothing more devastating than a fire that takes away valuable orone-of-a-kind paperwork, personal information, pictures or achievements. That's why we developed the fireproof bag- Protect your financials, personal information,document notebook, that won't let you down when emergency strikes. QUADRUPLE LAYERS PROTECTION:Fireproof document bags are made of new upgraded double aluminum foil material non-itchy silicone coated fiberglass which stands up the temperature up to 1832 1000 .Fireproof bag is certified by ROHS IEC62321 Certified fire protection.Fire and water resistant features protect your legal document files, passport , cash, jewelry , photos, laptop and other valuables. 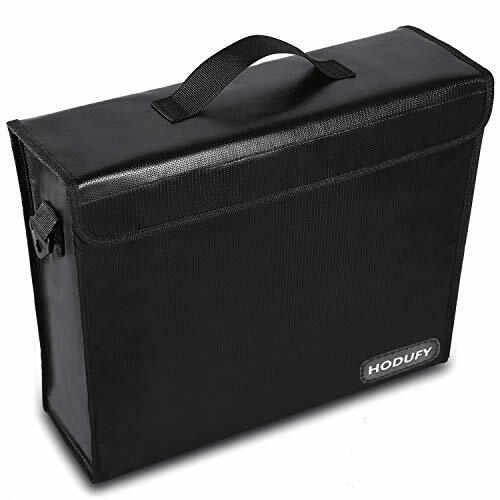 DOUBLE POCKETS:15x11 large capacity, double pocket design allows you to load more important documents.Fire safe bag features a new upgraded fire-resistant aluminum foil material (including stitching), and the double protection of the fire zipper and the Velcro increases the safety of storage and carrying. WIDE RANGE OF APPLICATIONS: Fireproof document bags are ideal for office or home.Combining a fireproof bag and a SAFE BOX together is the best solution to offer your documents and valuables complete protection in any fire accident. You can also give fire bags as gifts to customers, family, employees, etc. Original Intention:Accidents happen when we least expect, and there's nothing more devastating than a fire that takes away valuable orone-of-a-kind paperwork, personal information, pictures or achievements. That's why we developed the fireproof document bag- Protect your financials, personal information,document notebook, that won't let you down when emergency strikes. 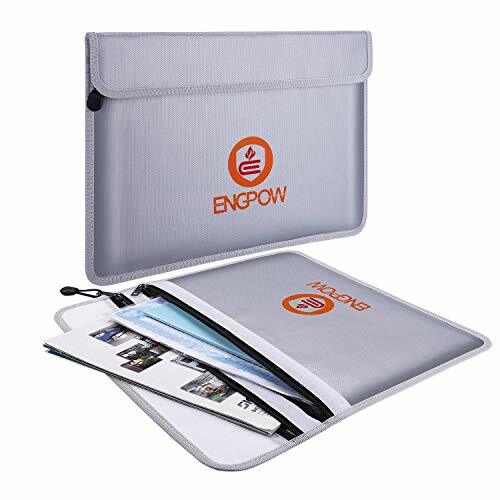 2 year Warranty: ENGPOW provide friendly after-sale service and no risk refund for our customers. If you have any issue,please contact us and we will try out best to solve your issue! Times change, things evolve and that is the main reason why, from now on, you won t need to worry about your valuable assets thanks to the innovative fireproof documents bags set by KSM which will protect your things against fire and water. This 2-piece set contains one fireproof bag (15 x11 ) and one fireproof wallet (6 x4 ) which help you store and protect your valuable assets such as documents, money, jewelry or electronic devices. Choose to protect the things that matter the most to you! All your personal belongings now benefit from a complete 360 protection due to the premium materials used in creating each fireproof safe bag which features dual-layered protection made of fiberglass exterior and aluminum foil on the interior. Complete protection for legal papers, certificates, money, electronic devices and jewelry due to the double layers protection The multiple functions of each fireproof deposit bag protect the things inside against fire, water, ice, dust and moisture Safe material, soft to touch, without causing any skin irritation Premium fiberglass non-itchy, silicone coated material The bag has a double zipper pull head closure type and the small pouch has a velcro fastening system Subtle, light, easy to carry and handle Don t waste the opportunity of having this useful and versatile money fireproof bag that can be yours by hitting the Buy Now button. Protect your precious values by keeping them safe anytime, anywhere in the fireproof document bag! RESISTANT, DURABLE MATERIAL: The new large Fireproof Document Bag is made of a fiberglass, non-itchy silicone coated material that can withstand temperatures up to 2192 F (1200 C). Our products are durable, resistant over time and they are designed to offer maximum protection to your important stuff under any situation. 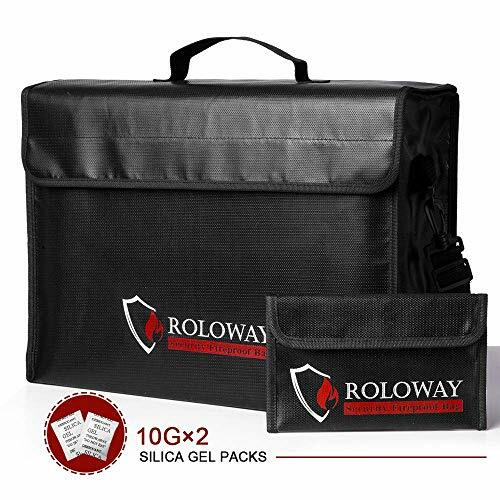 COMPLETE PACKAGE: This 2-piece set comes with a Fireproof Envelope Bag 15x11 for documents, electronic devices and you will also receive a small Fireproof Wallet 6x4 for money, jewelry or keys. The bigger Bag is destinated to protect all types of certificates, documents and electronics, while the Small Pouch takes care of your money and jewelry. 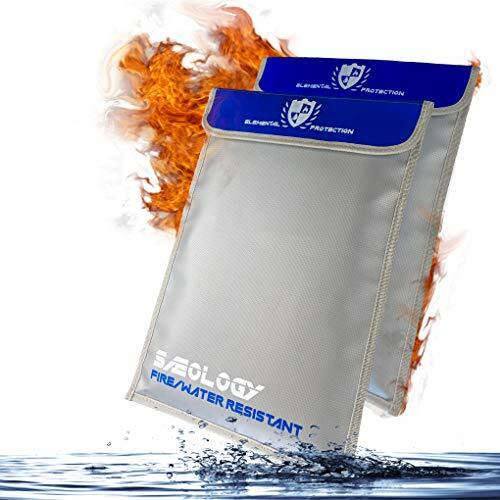 MULTIPLE PROTECTION: Each Fireproof Envelope Holder and Wallet features a double layered protection made to withstand both high and low temperatures. All your precious belongings will be protected against fire, water, ice, smoke or dust due to the premium quality materials used. FOLDABLE & COMPACT: The Fireproof Money Document Bag is extremely compact and easily foldable so it can fit any space such as drawers, luggages, safety deposits or any other storage place where you want to keep your important documents. The large bag can be folded (except when having electronics inside) without damaging the quality of the products. 30-DAY WARRANTY: We want you to benefit from the best services, that's why if, for some reason, you are not happy with your purchase, you have a 30-days warranty to return the products and receive a full refund. Click on Add to Cart button NOW and get this amazing new product. Fire and Water Resistance - The interior of high-quality liquid silicone coatings and aluminum foil can withstand water resistance and fire resistance temperatures up to 1000 C (1832 F), so you can keep all your valuables 100% safe. Larger Capacity - Our large capacity size 15*11 inch/ (38*28)cm, can hold more items, mobile phones, cash, watches and other valuables. Velcro and Zipper Closure Double Protection- Unlike other fireproof bag, fireproof bag has unique Velcro and Zipper closure design, provides you double and maximum protection. Safe, Durable, And Easy To Use - This compact, portable bag can be used at home, office, school, or company to protect personal valuables and important documents for business. 100% Satisfation or Money Back Guarantee - If you don't like our fireproof document bags, you could contact us and tell us your reason, we'll instantly refund your money and you can keep the fireproof document bags, no question asked, just a prompt, courteous refund! DID YOU KNOW? During a recent five-year study by the National Fire Protection Association (NFPA), U.S. fire departments responded to 1,000 home fires every day, on average. That's 42 every hour, causing roughly $228 in damage each second. At Saeology our goal is to provide amazing products at the highest quality level. We understand that wild fires and water floods can be unpredictable and devastating, which is why we want to to help you protect your life's most valuable and irreplaceable items. Our fire and water resistance tech bag is built to store and protect just about anything meaningful to you and your love ones. For 100% security and protection we recommend using our bag inside a safe box. Over all bag - 15"x11"
We know our bag will fit perfectly in your home, work or as a gift. BUY NOW! and stay protected. 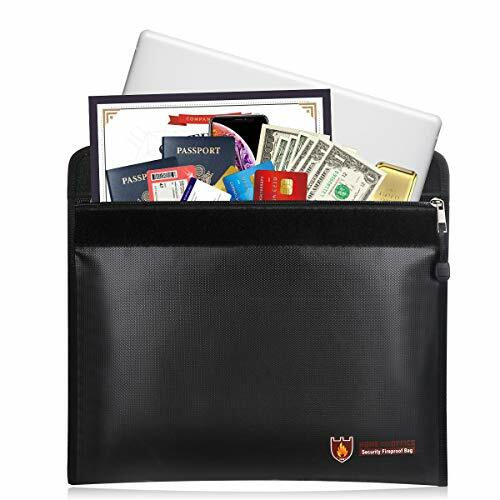 DON'T REGRET JUST PROTECT: Our fire resistance document bag is built with an extra inner pouch to neatly store your smaller and compact valuables such as jewelry, money, or passport; while the overall bag holds all your larger items and documents. THE RIGHT CHOICE: Made of double layer fiberglass and specially coated fire retardant seam for 2X stronger than others! Included bonus a silica dry pack to ensure your bag is 100% moisture free under any environment. PEACE OF MIND: Providing a seal tight zipper lock and extreme strength heat treated velcro that ensure bag waterproofing to protect and repels from water or any liquid damages. PROTECTED ON THE GO: Conveniently constructed to easy carry with you while you travel. Fits in your backpack, suit case, brief case, or luggage. Easily foldable for compact space storage or safe box. NO RISK TO YOU: We stand behind our product 100% and quality is our number 1 priority. We offer manufacture replacement or full refund if not satisfied for any reason within 1 year of purchase. BUY today for a PROTECTIVE tomorrow.